West Village is part of uptown - a trendy, affluant part of Dallas next to Downtown. I can't really afford any of the clothing there but walking around and sippin' lattes is just as fun. The color of her dress makes me think of all the nice things about summer. She works for the Michelle Patricks Salon in Cedar Springs (The Gayboorhood) and apparently this Friday, they are hosting a mini-fashion show where they will be doing the model's hair. July 31, 2009 @ 8 PM - I will be there. And after, there's a concert my girlfriend and best friend want to go to at Sue Ellens, THE lesbian bar/club in Dallas. 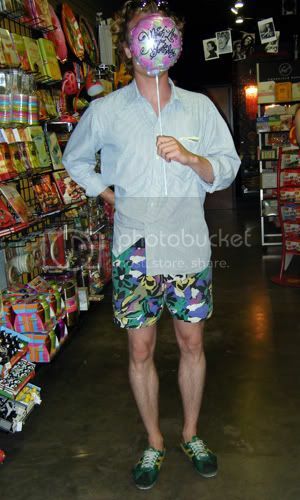 I saw this guy at Froggie’s Uptown, a really cute gift store. He didn't want his face to show up, even though I gave him props for the shorts! 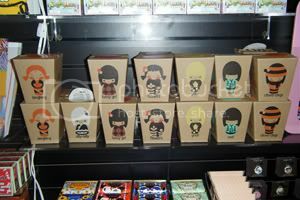 Also at Froggie's Uptown, I saw these adorable Momiji dolls on display. At $14.99, I can get half a tank of gas or a doll. But DAMN they're cute!! I think they're for people who don't have to make decisions like those.